The days have been slow, dark and dreary. January can be a tough month around here even though we’re technically in our “off-season.” It can be hard to keep your chin up when the weather is grey and rainy. I know we’re not alone and that January tends to be a very long month for many of you as well. I keep having to remind myself that eventually the sun will shine again and warm our bodies from the inside out. But until then, we’re going to have to rely on our wood-stove and the food that we put on our table to get by. Warm, nourishing and easy on the wallet, this hearty winter stew is just what the doctor ordered. 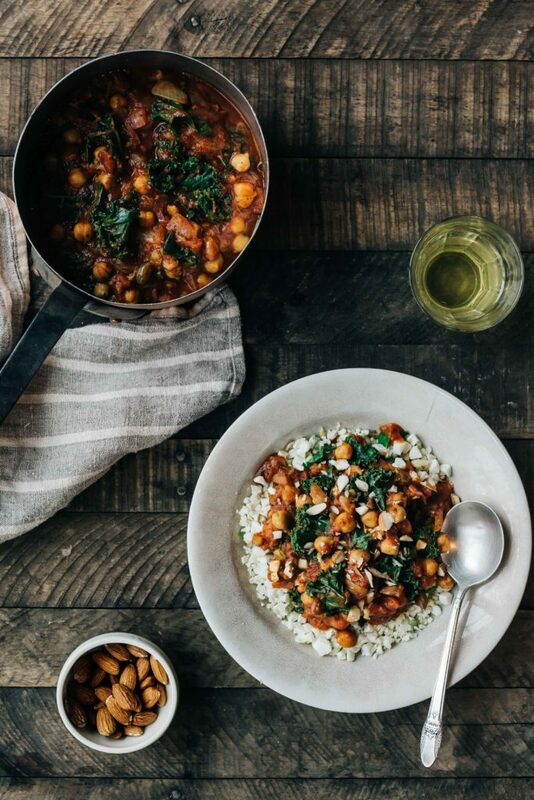 It’s a breeze to prepare and is bursting with deep moroccan flavors that will nourish and satisfy your body. I know kale isn’t the most traditional green to add to a moroccan dish but it’s what we’re still harvesting at the farm and it worked beautifully. We’ve been fighting a few head colds around here and spicy food has been our medicine. We served our stew on top of some cauliflower couscous (just blitz some cauliflower florets in your food processor until they resemble a coarse crumble) but you can use traditional couscous or rice instead. Also, just after I photographed this dish we added a few dollops of some goat milk yogurt to our stew. I highly recommend yogurt to help balance out the flavors. You don’t need goat yogurt, any kind will do. I hope wherever this post finds you that you’re healthy, warm and ready for a flavorful meal to share with your loved ones. Heat the olive oil in a large heaving bottom pan over medium heat. Add the onion and cook, stirring often until translucent and fragrant, about 5 minutes. Add the garlic, raisins, Ras el Hanout, salt, pepper, crushed red pepper flakes and cinnamon stick. Cook for about 1 minute longer. Add lemon juice, tomatoes, chickpeas and water. Bring to a boil. Reduce heat and simmer for 15-20 minutes, stirring occasionally. Discard the cinnamon stick. Add in the kale and cook until just wilted, about 3 minutes. Divide between bowls and top with toasted and chopped almonds and yogurt. Season to taste with additional salt and pepper if needed. Andrea, this was a total hit! Very fortuitous, as my husband requested something vegetarian for dinner this morning, and then your email arrived. I decided to serve it on actual couscous, so I added the cauliflower to the stew. This required me to add more water, so I had to bump up the spice and lemon juice somewhat. But the results were delicious! I didn’t have Ras el ganout (or garam masala), so I Googled it and made my own with spices on hand. Very simple. Thanks for yet another great recipe! This is a new staple at our house. We cook for the week on Sunday afternoons and the flavors in this get even better as they meld in a container for a few days. Delicious! Thank you! I’m so happy you all enjoy it as much as we do! Happy cooking!